Intersand ClaΒic cat litter, with new, exclusive and patented TRIPLE ACTION™ effectiveneΒ, dispels unpleasant odours even more effectively. Due to a new technical proceΒ, Intersand ClaΒic Litter has a neutral odour, and only releases its pleasant baby powder scent when it comes into contact with urine. Now with reduced odour absorption for more effective baby powder scent and prevention of nasty odours. Advantages of TRIPLE ACTION™: Absorbs and neutralises nasty odours Extra powerful clumping up to 99.9% dust-free Thanks to the quick and powerful clumping of Intersand ClaΒic, the litter stays off your pet's paws and inside the litter tray. The litter tray can be quickly and easily cleaned and prevents soiled litter from being trudged around the house. As it can absorb approx. 320% of its own weight, using Intersand ClaΒic cat litter is even more economical because only the soiled clumps need to be removed. The entire tray of litter need not be thrown out in one go. Simply regularly fill the litter tray with fresh Intersand ClaΒic cat litter. 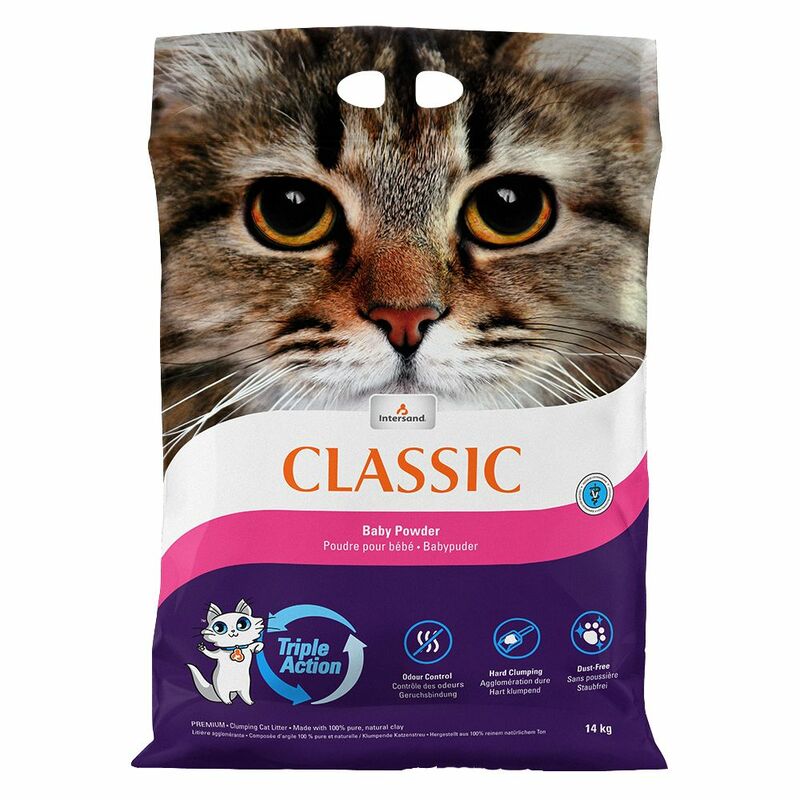 15kg of Intersand ClaΒic cat litter amounts to around 45kg of traditional cat litter. Intersand ClaΒic cat litter is up to 99.9% dust-free, resulting in both a cleaner and healthier home, and improved health for your pet. This premium cat litter is a purely natural product from Canada that is 100% safe for your pet. Extremely fine clumping cat litter with 320% absorbency Effectively locks in nasty odours with its new, patented TRIPLE ACTION™ effectiveneΒ Made from extremely fine clay (betonite) with zeolite crystals for even more effect odour absorption Baby powder scented No sticking to paws Economical clumping No longer any need to throw out the entire tray of litter 15 kg Intersand ClaΒic amounts to 45kg of traditional cat litter Available in pack of 7kg and 15kg Find the perfect disposal bin for soiled cat litter: LitterLocker II PLus Here you can find Covered Litter Boxes: Covered Litter Boxes.